I love aubergines: I’m seduced by their shiny, plump purple skin, and melting, almost meaty flesh. This simple but surprisingly yummy Lebanese dish is ideal for lunch or supper, and serves 4. 1. Whip the yoghurt with garlic and salt, and set aside while you make the rest of the dish. 2. Slice the aubergines. Heat the oil in a non-stick frying pan, and fry the aubergines on both sides until they’re golden brown and cooked through. 3. Remove the aubergines and place in a heated serving dish. 4. In the remaining oil (add more if necessary), fry the peppers until cooked. Add the tomatoes and stir for a few minutes until softened. 5. Add salt, black pepper and parsley. 6. 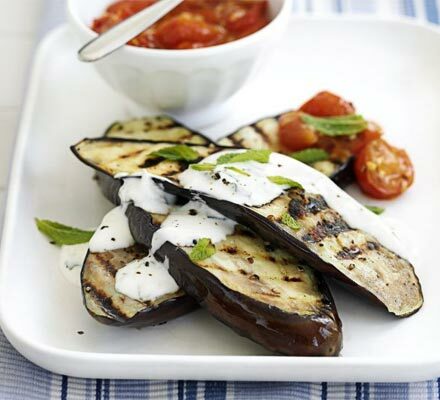 Pour the pepper and tomato mixture over the aubergines, and top with the garlicky yoghurt. Serve hot or at room temperature with pitta bread.